Should we be be worried about the future of this site? A question is not considered answered until a up vote happens on one of the answers. We need to probably need to recruit some of the people who tend to answer our kind of questions to come and regularly peek at our site. According to the overview page on Area 51, we're not quite there yet. 1.5 questions per day, when 10 questions per day are recommended. 88% answered, when 90% is recommended. 73 "active" users with 200 reputation or more, when 150 are recommended. 4 "avid" users with 2000 reputation or more, when 10 are recommended. 1.4 answers per question, when 2.5 are recommended. 261 visits per day, when 1500 are recommended. 2.6 questions per day, better but not quite there yet. 86% answered, let's be careful, this metric is getting worse*. 82 "active" users, slightly better. 5 "avid" users, slightly better. 1.4 answers per question, no change. 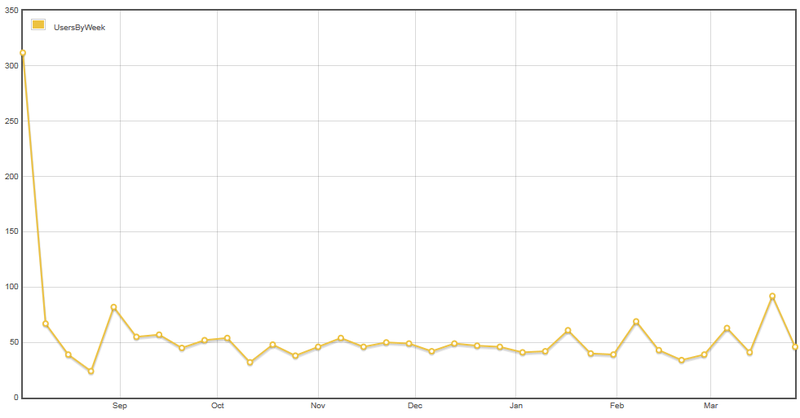 315 visits per day, slightly better. Graphics programming being a fairly specialized topic, some of these numbers probably can't be improved by much: there are only that many people doing graphics programming anyway. But some could, and should, definitely be improved. After a long hiatus, I answered a few questions last week, and skyrocketed to 1st rank for this quarter. I think it should have taken me a lot more activity to reach that point. In my opinion a simple effort at reviewing questions without an answer would already do a lot for the community; 90% questions answered doesn't seem far. We definitely more avid users, but I'm not sure how to address this: a decent answer can easily take a lot of time, and there are simply questions we don't have an answer to. 1.2 questions per day, this is slow. 80% answered, this metric keeps going in the wrong direction. 7581 "active" users and 180 "avid" users, this is excellent. 1202 visits per day, is really close to the recommended 1500. While there are definitely things to improve here, I don't think we need to be worried (too much). We do get a steady amount of new users (about 40 - 50 per week) and also continuously get new posts. The average numbers of new questions and answers oscillate roughly between 1.5 and 3.0 new questions and answers (each) per day. I'm looking at the questions/answers per day numbers here, because other publicly shown metrics also show these numbers. For example, the list of all sites of the SE network or the Area51 page. This is not bad - there are a lot of sites in the same range of questions per day. And you mentioned the quite low answered percentage. That's actually a metric I'm a bit concerned about and I'd like to get that back up above the 90%. We need to get more people to answer questions and I count myself to that group who should answer more. 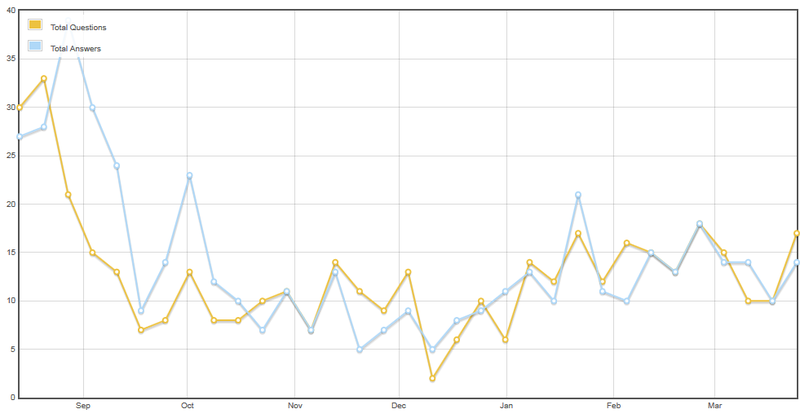 Also, our number of visits per day is very low, when compared to other sites. One thing we could try, is to create some community ads to display on other sites. These could bring new users to our site and hopefully also new users who ask and answer questions. Quite recently, we had a few questions that lasted a bit longer in the Hot Network Questions list, which temporarily boosted visits and new user counts. I agree the stats for this community do not look perfect on first glance, but: Should we be be worried about the future of this site? No! If there's enough moderation for a public beta site to consistently remain free of spam, for flags to be cleared, and for our Be Nice policy to be upheld, your site will remain open. However, if community leaders drop off, flags sit without being addressed, and we can’t find any suitable volunteers to step forward, the site gets closed. So, to answer your question more directly, no we don't have to worry about the future of this site. Small and less active communities are quite welcome on the network. The most important stats are the answer ratio and answered rate, which look basicly okay. This means, if a user posts a question, it will probably answered with a 88% chance and will recieve 1.4 answers per questions. How do we improve the question rate?